Faye has been cooking for over 50 years and loves to share her recipes and cooking tips with everyone. 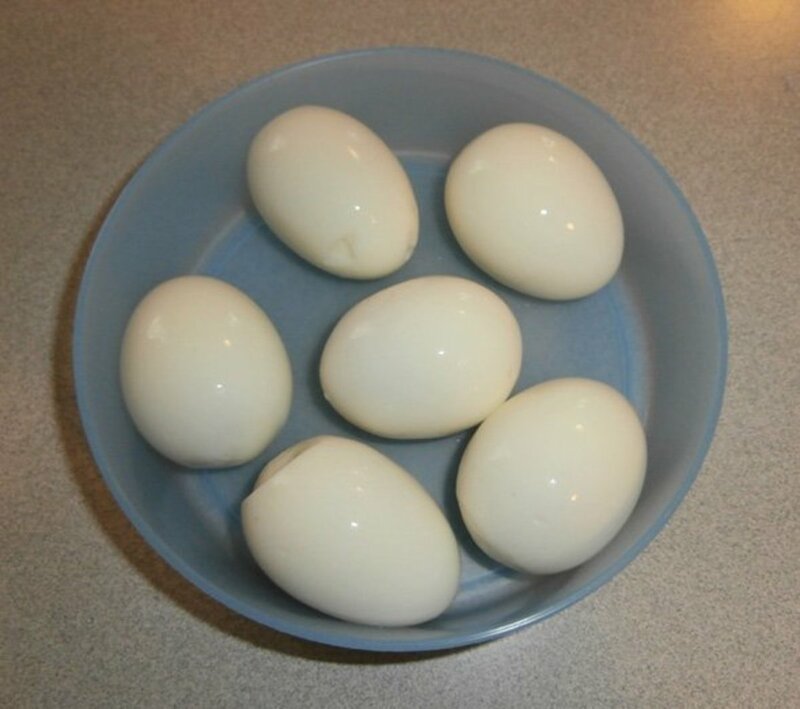 Let me show you how I peeled these hard boiled eggs. 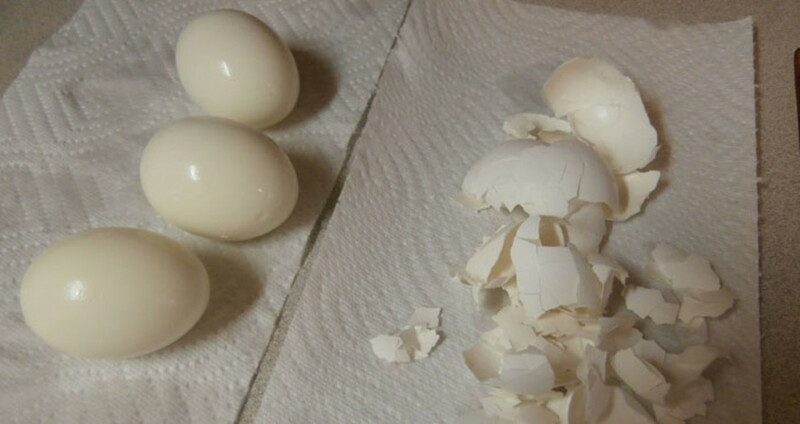 People have been peeling boiled eggs for years, and yet, everyone is still looking for the easiest way to produce a smooth, perfectly peeled egg! Many people have developed their own special method that works for them (most of the time anyway). Some people are still in the developmental stage of a great break-through. I'm sure if someone actually finds the way to peel a boiled egg perfectly every time, it will rank right up there with the discovery of a new planet or wonder drug! There is nothing quite as frustrating as having an eggshell that wants to hang on for dear life! I have been boiling eggs at least twice a week for over 5 years now. My husband likes to eat one with his tossed salad for lunch and I keep them in the fridge for him to eat whenever he wants. In this article, I will show you the method that usually works for me. Even so, there are times when even this fails. I make no guarantees; this is only my opinion and experience. Hopefully this will help you leave frustration behind. 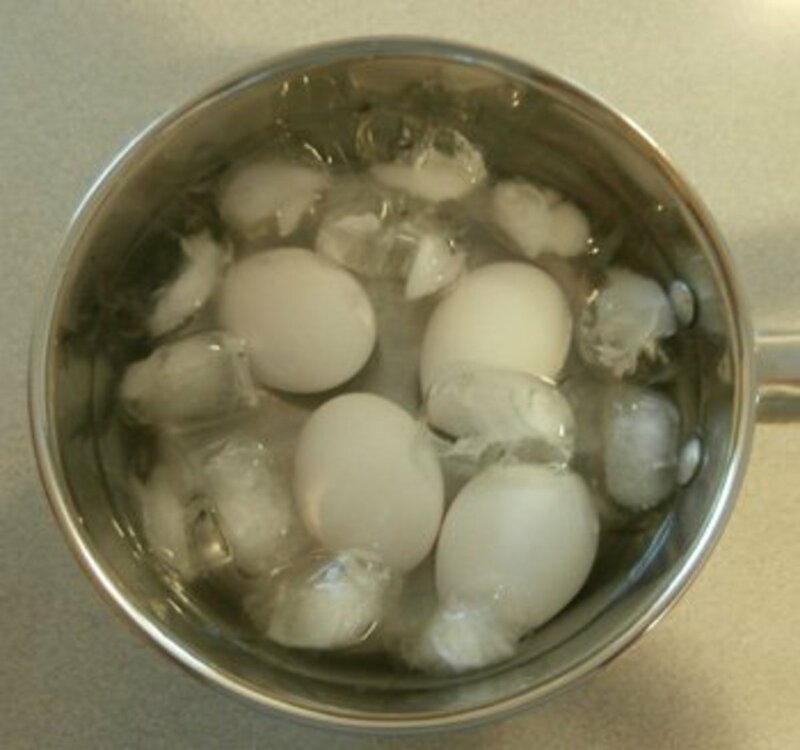 Drain the hot water and run cold water over eggs to cover them completely. Add ice immediately to make the eggs cool quickly. Cool in ice water for about 10 minutes before peeling. If you let them set too long, they are actually harder to peel. 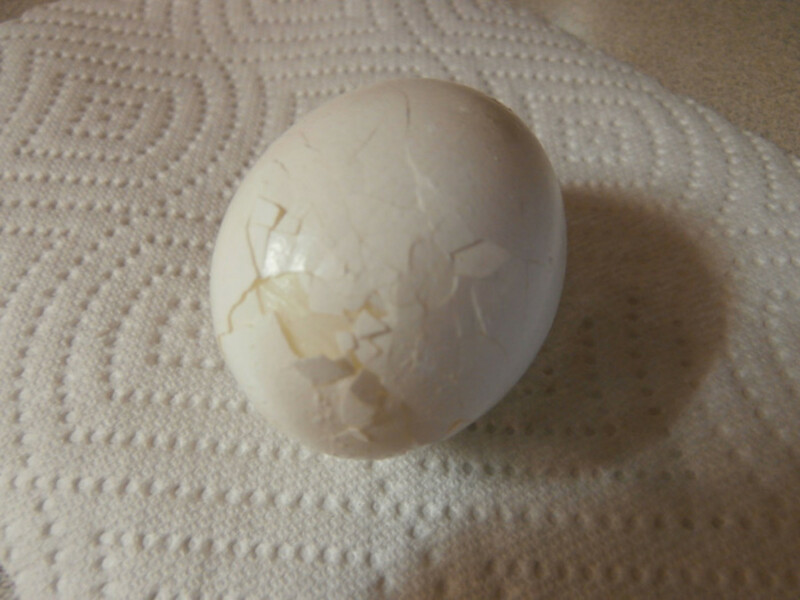 Crack the large end of the egg on a hard surface. This should reveal a small air pocket. Starting at the air pocket, peel back the shell, being sure to get under the thin membrane between the egg and shell. Continue peeling until all shell has been removed. Rinse your egg well to make sure all of the shell is gone. 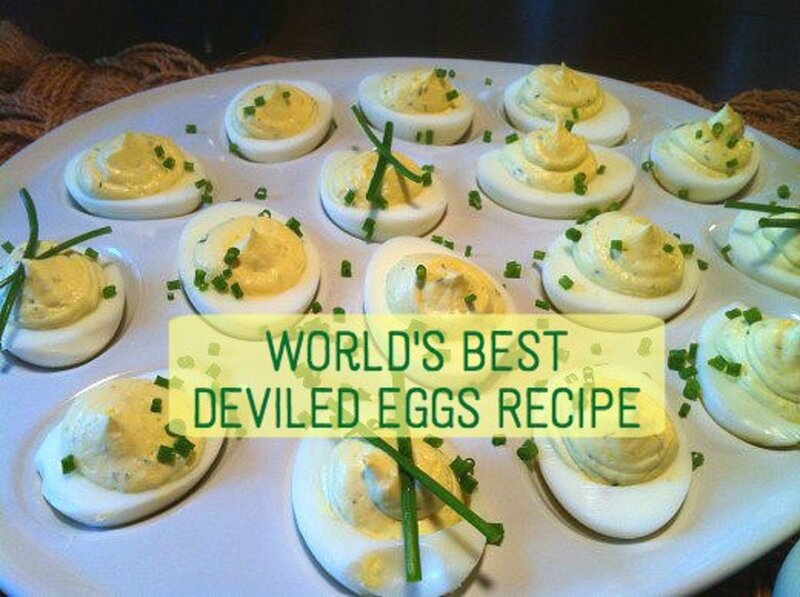 Cool eggs in ice cold water as soon as they're finished cooking. 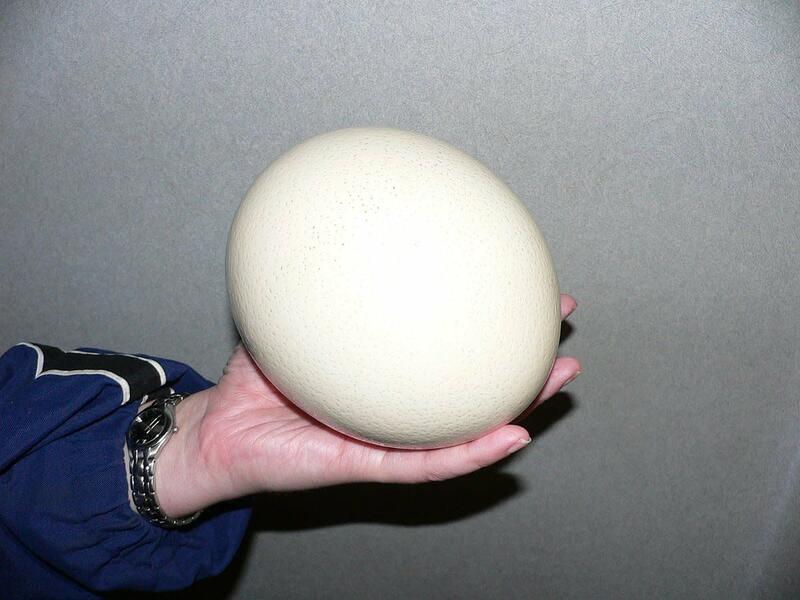 Hit the large, round end of the egg on a hard surface to crack the shell. 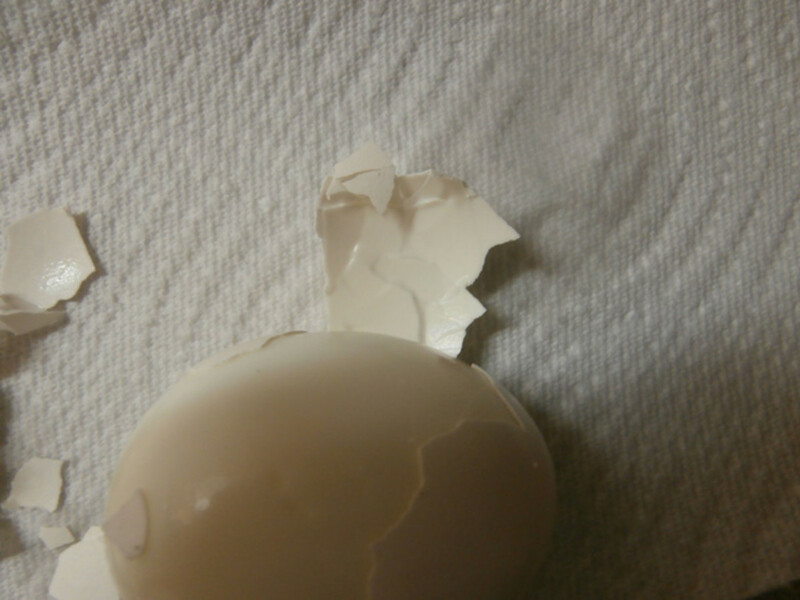 Carefully peel back the shell, starting at the air pocket, and making sure the thin membrane pulls away from the egg. Continue to carefully peel the shell until it is all removed. The biggest problem you'll have is that pesky membrane! If this membrane is sticking tightly to the egg, you are out of luck, because when you peel off the shell, it will take the egg with it. Therefore, a mangled egg! Sometimes, you will be lucky, and it will just hang on in a few spots, and the egg is not a total loss. Ice cold eggs are easier to peel. I don't know why, but it works best for me. Start by cracking the larger, rounded end of the egg. There is usually a little air pocket on this end and, in most cases, the membrane will be attached to the shell and peeling will go smoothly. This is the thin membrane between the shell and egg. This is what that thin membrane (or skin) looks like that I was telling you about. Can you see it at the top of the shell? If you can just get that to pull loose from the egg, you will be peeling easy! Rinse your peeled eggs to make sure all of the little bits of shell are all gone. These eggs were peeled using the method on this page. I always peel my eggs over a paper towel to make cleaning up the shells easy. 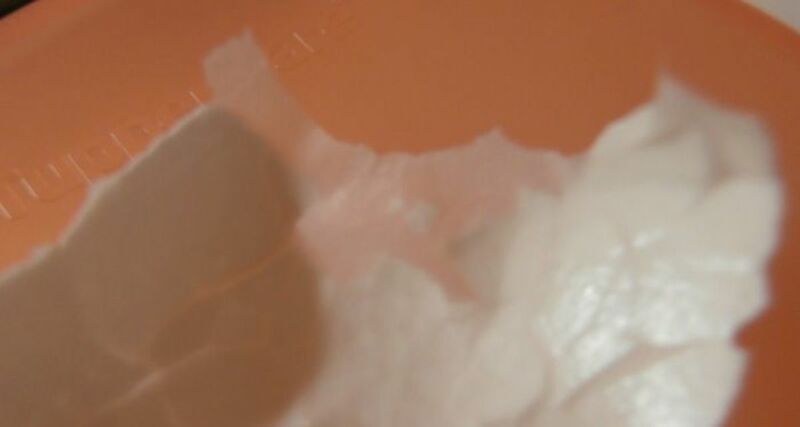 Peel over a paper towel for easy clean-up. I always peel my eggs over a paper towel to make cleaning up the shells easy. Rinse your peeled eggs. Be sure and rinse off your eggs (I like to dry on a paper towel also) to make sure all of the little bits of shell is all gone. There's nothing worse than eating a piece egg shell! Ugh! 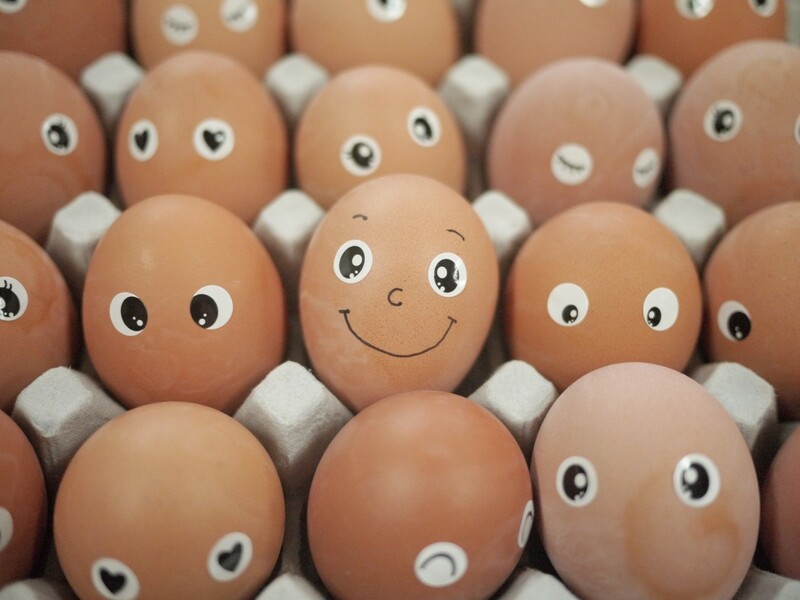 You can store your hard boiled eggs in the refrigerator for up to a week. 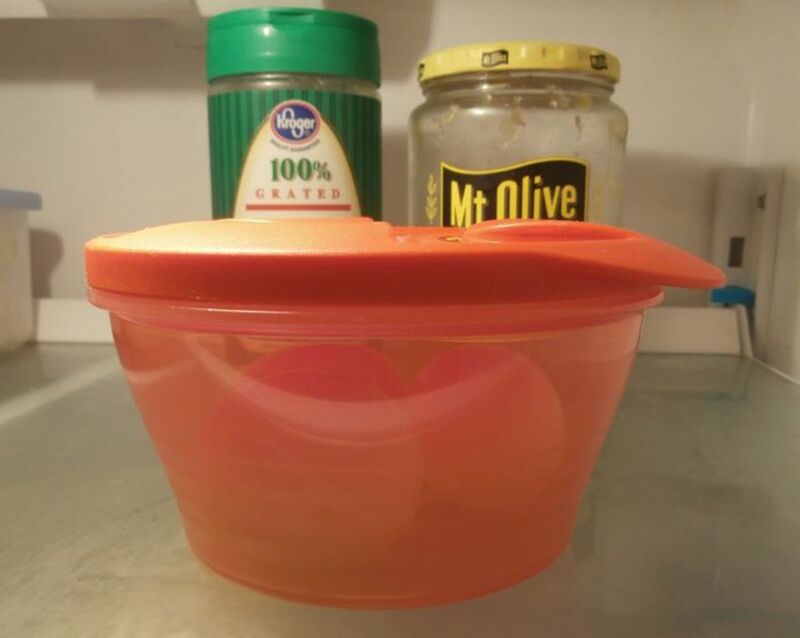 I always store my extra hard boiled eggs in my fridge, in an air-tight Tupperware container to use later. My hubby likes to eat them with his tossed salad for lunch. This will keep them fresh for a week, no need to cook an egg every day, and it also keeps the smell contained. Is There a Fool Proof Way to Peel Eggs? I hate to say it, but I don't think there is really a fool-proof way to achieve perfection every time. There are debates about they will peel easier if you cook them this way, or that way, or if the eggs are fresh or not, cool or at room temperature. I’ve tried many different ways of cooking, and none of them always work. I think it's mostly just luck or if the "Egg Gods" are with you that day! Many claim it is the way you boil them. There are many methods for boiling eggs. I've cooked mine different ways, but none have been fool-proof. This page is not about cooking them, so I don't get into that part. Watch the videos below for more methods. 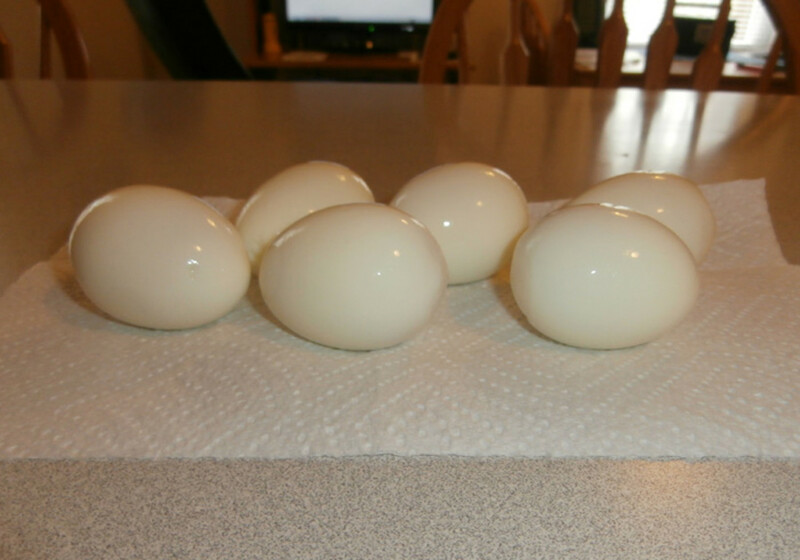 The video below shows another easy way to peel hard boiled eggs. The method she uses in to put the cooked egg into a glass jar with a little water. Put the top on and shake it up good. Take the lid off and when you remove the egg, the shell will come right off. It looks easy, but I'm not sure it will work every time, especially if that membrane is stubborn. Video: Peeling 5 Eggs at the Same Time! The video below shows how to peel 5 eggs at one time. (There were actually 6 in the bowl, but one egg didn't peel.) He used basically the same method, but more eggs. I'm definitely going to try this and see how well it works! I leave you with one last video. This one includes 3 methods, all with a little different take on the ways you've already seen on this page. I mostly included it so you could see her demonstrate Method 3, as it shows what mishaps can occur when doing it. It's pretty funny, you'll love it. Note: Keep in mind that these are videos that may have taken more than one try to get a perfect outcome. These methods may not work every time and also might take a little trial and error on your part. But, keep trying. 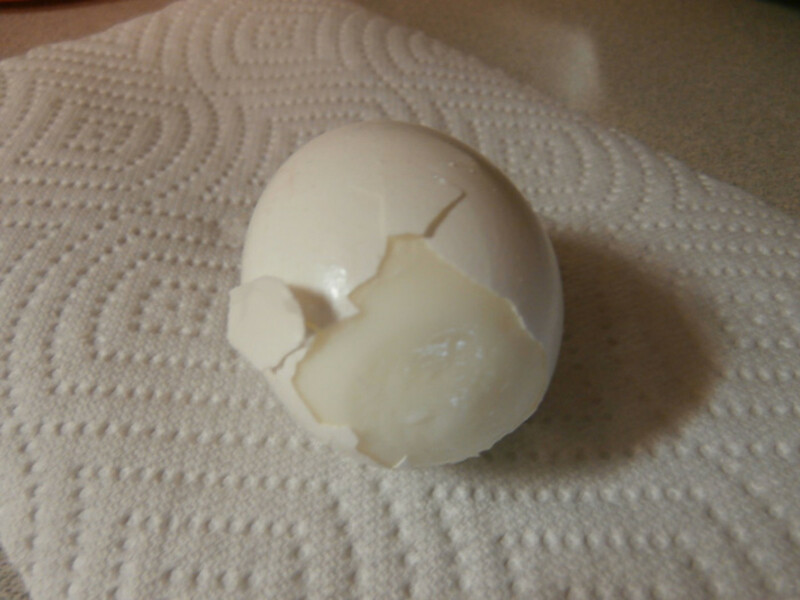 In this article, I showed you the method I use to peel hard boiled eggs. 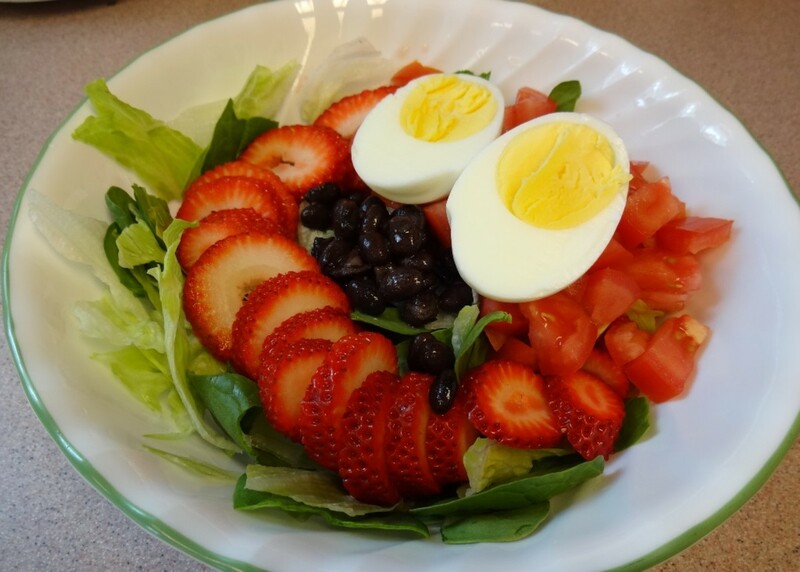 The main point is to get those cooked eggs into ice water as soon as they're cooked. 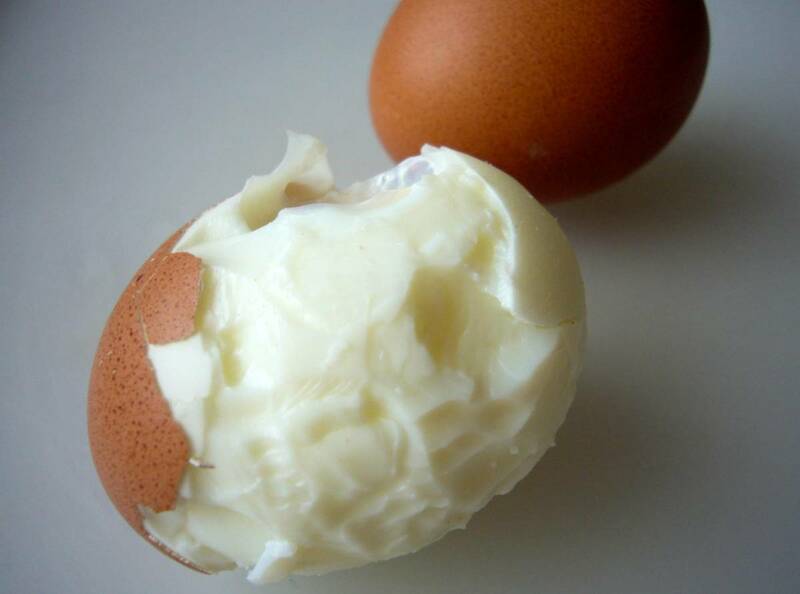 After cracking the shell on the round end, carefully peel the egg, getting under that pesky, thin membrane that can cause so much damage if it sticks to the egg. I also included a few informative how-to videos. I think almost everyone has their own method and I'd love it if you would share yours in the comment box below. Good luck. Nice hub! Egg peeling is a difficult task sometimes! I would surely try your method, the next time I have one! I have heard that the heating and cooling method works on many foods. I usually peel my eggs this way too. I saw this "quick chill" method first on Jacques Pepin, a famous French TV chef. BTW plants love egg shells add to the soil or compost bin. Helpful - pinned to my eggs board. I am really glad that eggs have lost their bad rap. I follow all your steps, except I've never used ice, just cold tap water. Maybe that's the extra trick I need! Thank you for sharing it.Like you, I've tried a lot of them--tricks that is. 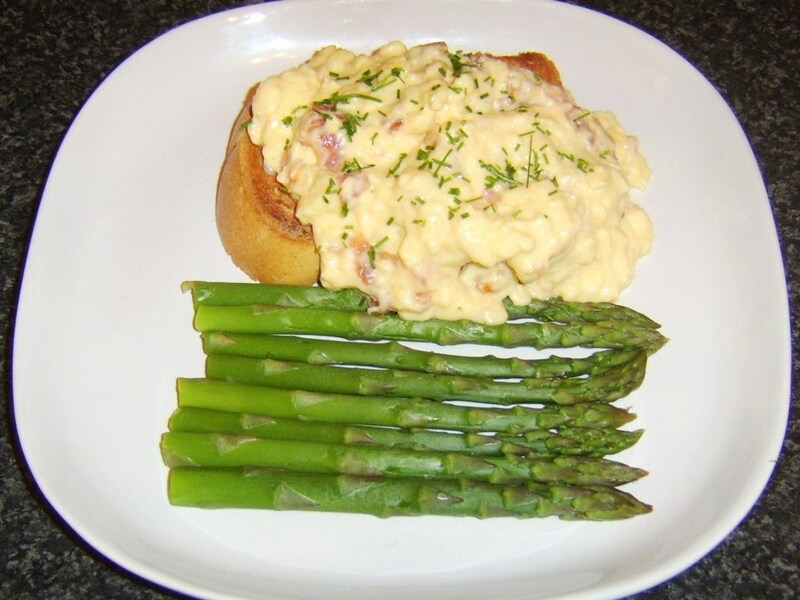 What works best for me, and which I seldom do because I forget, is to take the eggs out a couple of hours before boiling and let them come to room temperature. Then I drop them into cold water, bring it to a boil, boil 5 minutes (we like our eggs almost hard), remove and dash under cold running water until the shells are cool.Like you, I peel from the air pocket. This works most of the time. Lately though, I've been buying farm-fresh pastured eggs, and they are so fresh that they are very difficult to peel, even using all my old tricks.Going to try your ice trick. Thanks again! I peel mine the same way you do. I didn't realize so many people have trouble peeling hard-boiled eggs. Maybe it's because I use very fresh eggs. I never thought about peeling them all at once and storing them that way though. Thanks for that tip. I'm convinced that week-old eggs peel better than fresher ones. Also, I read recently to add a bit of baking soda to the water. I've done that three or four times now and I'd say that hack definitely makes a difference. Of course maybe next time it won't work at all... Thanks for the gadget and the tips! @SpotforAlandra: Thanks so much for your visit and comment. I love the idea of the egg cookers! No peeling needed! Awesome! I've added this product to my page for all to see. If anyone does try it, please be sure and come back and let us know how you like it. yep, that's what I do as well :) There's a little space at that end as you wrote. It's a messy task :) There are sets of small egg-shaped containers with lids, that you crack each egg into, then put the lidded containers in the pan of water to cook. Then, when cooked, there's no shell to remove :) They do work. I used this method when I owned my restaurant. It was really easy and save some kitchen prep time.